After racing in the French Alps for the past month, we headed to the Italian Alps, less than a couple hours north of Milan, right by the Swiss border. This remote location, nestled in the high italian mountains is where the third round of Superenduro is happening. Welcome to Madesimo, a cute little family resort. There is only one lift for mountain biking here and a few trails in the bike park. There is a wide network of multi-use singletracks all-around town that go either down the valley or higher up in the mountains. The previous two rounds of Superenduro were on the mediterranean coast in Liguria and Tuscany, so it was a drastic change from the coastal trails. 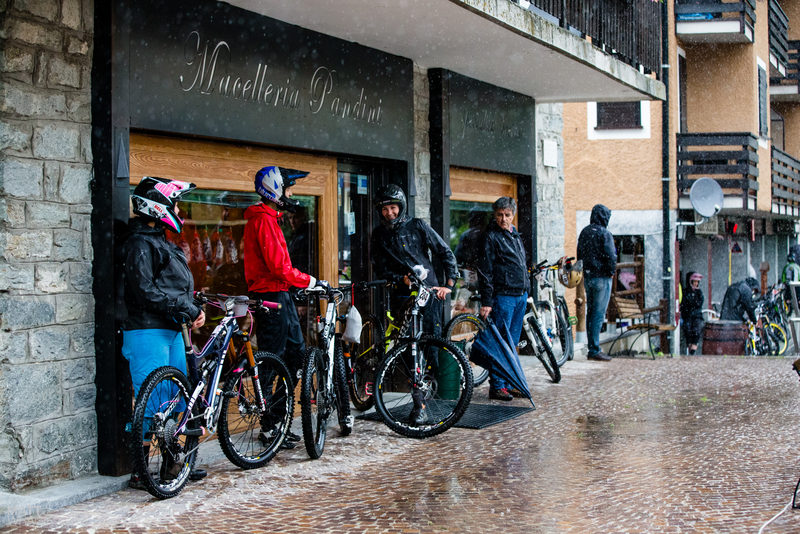 The Alpine courses that Superenduro concocted us was unfortunately disrupted by the weather. When heading to the high mountains, you have to expect the weather to change quickly. We had a nice first day of racing with a couple showers, nothing too dramatic and then the sky opened up from saturday to sunday and it was a proper downpour all-day sunday. We were supposed to have a total of 6 stages over 2 days but with the dramatic weather conditions, the organisation decided to revised the race schedule. We ended up with 3 stages on day 1 and a single stage on day 2. The 3 stages on day 1 were a mix of what the mountain had to offer: first stage was more DH and technical with natural rock gardens, slippery roots, a descent downhill grade and not too much pedalling. This is definitely the type of terrain I like and that suits me. The second stage, on the other side of the valley, was more a natural hiking trail, with a bit more pedaling and a few trial-like sections, it was quite fun. For the last stage on saturday, we went back to the bike park and had a pedally stage to finish the day: a man-made rock garden, some nice burms and a few whoops, nothing really technical to finish sprinting in the center of town. With the torrential rain that didn’t stop on sunday, the organization met with the rescue team and the riders and decided to shrink down the race to only one final stage: same as the last one from the day before. Even though we raced on it the day before, it was a totally different terrain due to the amount of rain that got dumped on us. 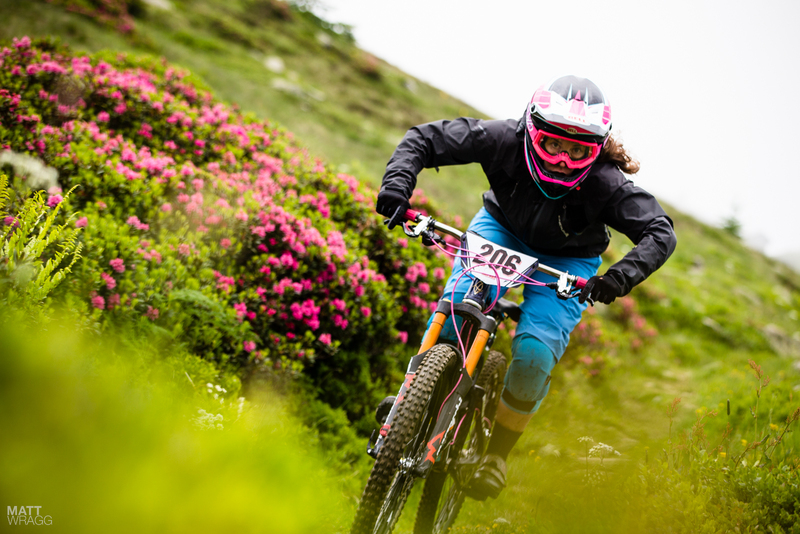 This 3rd round of Superenduro being held between two rounds of EWS (Valloire last week and La Thuile in 10 days), it brought a more competitive field of international racers (Scottish, Swiss, Kiwi), which was really nice. I finished in 5th behind a stacked field of international women and ahead of my usual competition. It’s a small victory after last weekend trip to the hospital (I busted my hip in Valloire and as I couldn’t walk paramedics thought I had a broken pelvis. After waiting for the X-rays results for what seemed forever, it just turned out to be a bruised hip) and a bad crash on stage 3 this past weekend. We are back home for a week, so we can chill, ride some home-trails, recharge. 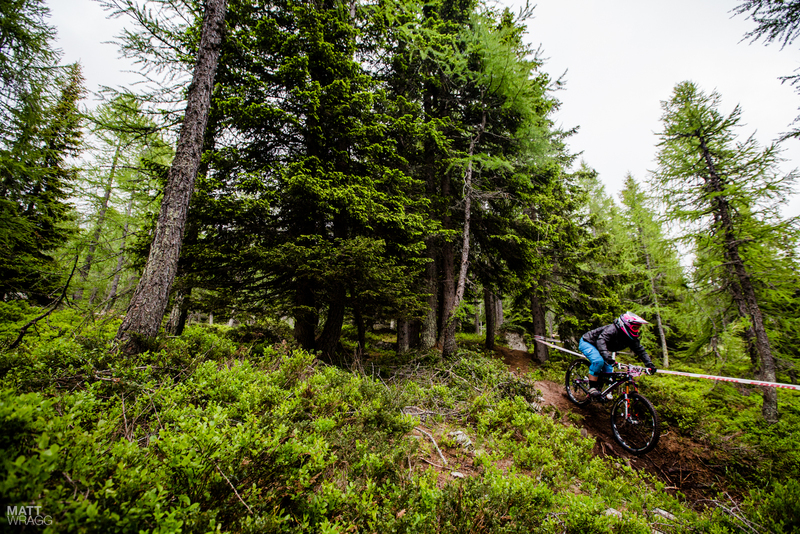 And then we are heading to La Thuile, Italy for the fourth round of EWS for some international challenges.